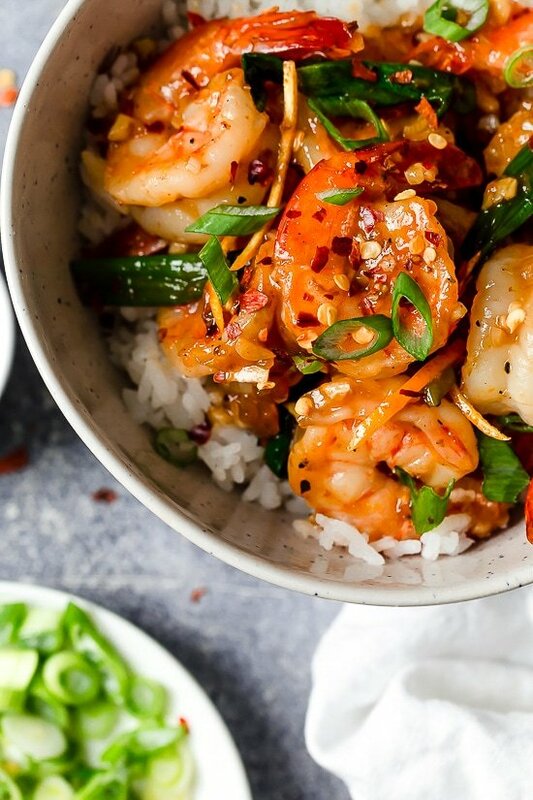 For a quick and easy weeknight stir-fry, you will love this easy Asian Honey Garlic Shrimp recipe! It’s sweet, spicy, savory, and so good!! I love a good stir fry, and trying new ways to make Chinese restaurant–worthy meals in my own kitchen. A few favorites are lightened up General Tso Chicken, and Chicken and Broccoli Stir-Fry. 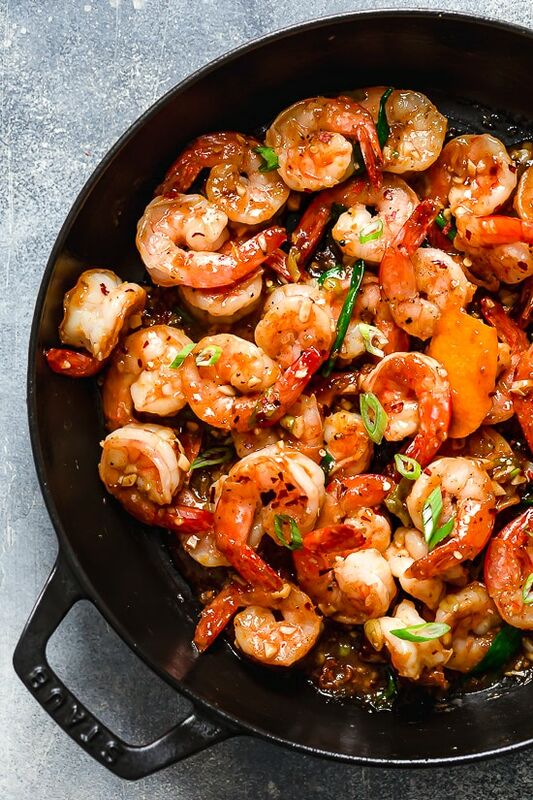 This shrimp dish, made with orange juice and orange zest, scallions and red pepper flakes for some kick is a new favorite! This whole dish takes under 20 minutes to make. The recipe was adapted from Chrissy Teigen’s Cookbook, Cravings Hungry For More (affiliate link). Her gorgeous cookbook is filled with lots of dishes I can’t wait to try, but I especially love her Asian recipes. Since her recipes aren’t low calorie, I just make a few tweaks to lighten them. 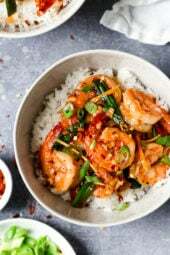 For this recipe, I increased the shrimp and sauce to make the dish a bit more substantial and used a bit less honey and oil. It came out fantastic and was sweet enough with the fresh orange! To save time, I like to buy peeled shrimp. I prefer to buy my shrimp frozen since fresh is not available, rather than thawed which may have been sitting out a few days. 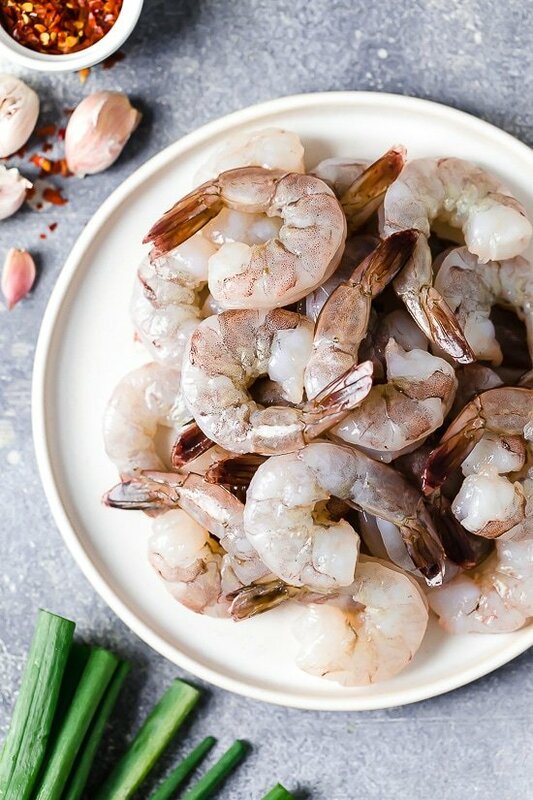 To thaw frozen shrimp, I transfer it to the refrigerator the night before or I run it under cool water for a few minutes in the sink. If you’re making this for the kids and don’t want it spicy, you can leave out the red pepper flakes and just add it to your dish before serving. You can serve this over basmati or brown rice, or try it over cauliflower fried rice to keep it low-carb. Finely grate the zest from 1 orange, about 2 teaspoons. Juice both oranges into a bowl (you should have about 3/4 cup). Whisk in the honey, soy sauce, and vinegar with 1 tablespoon of water. In a small bowl, combine the cornstarch with 1 tablespoon of the orange-soy mixture to form a paste, then stir that back into the bowl with the rest of the orange-soy mixture. Pat the shrimp dry with paper towels and season both sides with salt and pepper. In the largest skillet (or wok) you have, heat 1 teaspoon of the oil over medium high heat until shimmering-hot, almost smoking. Add half of the shrimp, spread it out in one layer, and cook until the underside is bright pink, 1 to 1½ minutes. Flip and cook 1 minute more, then transfer the shrimp to a plate. Repeat with another 1 teaspoon oil and shrimp. Set aside. Add the remaining teaspoon of oil to the skillet. Add the garlic, ginger, scallion whites, and red pepper flakes and cook until fragrant, 30 seconds to 1 minute. Add the orange-soy liquid and the orange zest and cook, stirring, until thickened, 1 to 2 minutes. 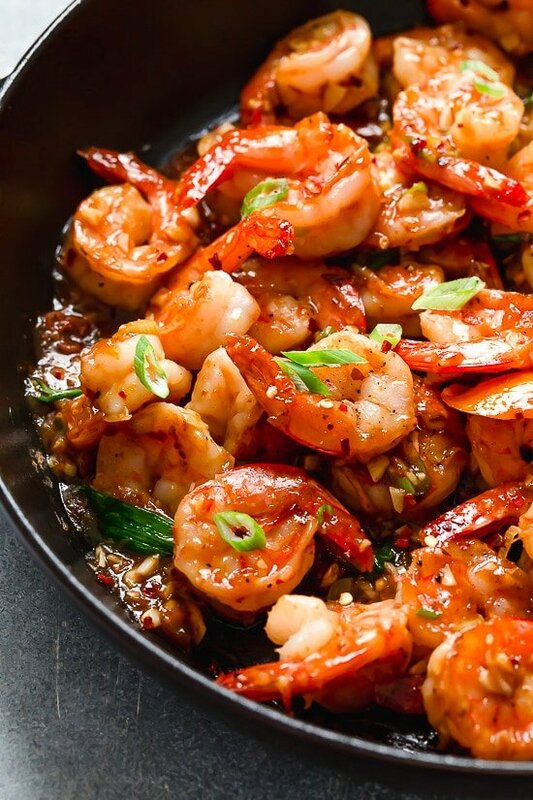 Return the shrimp to the skillet, add the scallion greens, and toss to coat with the sauce. Divide the shrimp among 4 bowls and serve with rice. Adapted from Cravings Hungry For More. This recipe has become one of my favorites, I’ve done it with chicken and scallops. Last night, I put the sauce in a small pan, heated it up just enough to thicken it and poured it over salmon before I baked it. Simply delicious! Gina found your site by way of Emily bites .Made this tonight and my husband said it was the best shrimp dish that I have ever made .He asked me if I could comment and tell you that it was good enough to be on a restaurant menu .I thought that you explained everything perfectly. I personally think if people are getting a bitter taste from the orange zest ,is because they must’ve gotten the pith it will make it bitter . Thank you so much for your delicious recipes. Sorry to be so. long winded. This was an amazing dish! Used the peeled & deveined Argentinian Red Shrimp from Trader Joe’s. Already had clementines so used those instead of oranges. Very good!! Turned out well, but for me the orange is overpowering. I think it would be better without the zest, it just has a bit of an…unpleasant flavor to it. I love this recipe. The first time I made it according to the recipe. I went to make it a second time and I improvised with limes and Sriracha and made it a lettuce wrap. Awesome! This was good, but a bit too heavy on the orange flavor for my tastes. I do love the format of your site and am looking forward to trying more recipes. I follow a gluten free diet and just started weight watchers, so I appreciate how easy you make it to find exactly what works for me! Thank you! Made this yesterday and WOW!! So full of flavor. My husband and I thoroughly enjoyed the meal. Looking forward to leftovers tonight! Definitely a keeper. Made this tonight ! Love the taste and kick to it ! My wife and I love, love, love this meal! Making it again tonight! This was quite good recipe. I am currently trying to use black garlics in recipes and hope you have any ideas for the same.Please suggest. Just made this last night! Super easy, fast and delicious! Better than takeout! I’ve made this twice in two weeks. We love it! I serve it over cauliflower rice for me and brown rice for my husband. I made it for our grand daughter tonight and she wants me to send her the recipe! Just the right amount of spicy! 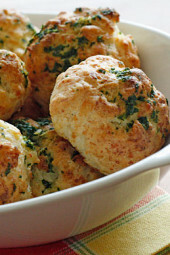 So flavorful and easy to make! OMGosh, this is the best recipe I have tried from SkinnyTaste. We have it at least once a week. A keeper for sure. Thanks Gina! My son and I made this for dinner and it was delicious! What a joy to cook with my teenager and then have a wonderful healthy meal. Thank you! This recipe is great for an easy dinner. Since I like to meal prep (and hate reheating shrimp) I prepped the sauce, chopped garlic and ginger, and rice ahead of time and quickly cooked it each night. Took maybe 15 minutes max. Me and my family loved this dish! Served over rice and a side of broccoli. I do WW and this is a delicious, low point meal that satisfies even non dieters! This is my first try at one of your recipes, now I can’t wait to try more. Thanks!! It was ok, but too heavy on the orange. Made for a very tangy taste, vs a subtle hint. Broccoli would have been a good addition! I knew I was going to be pushed for time on the night I wanted to eat this, so I prepped everything ahead of time ( I cooked the shrimp with sauce as per the recipe and refrigerated it ) then reheated the following day stir fry style. I added cooked brown rice, sauteed mushrooms, zucchini and asparagus. It was SOOOO good. Loved by my 12 yr old DD. Thanks, Gina.. another winner. This was delicious and very easy. I will definitely make again! Made this last night, and family & I agreed that it was way to much orange flavor, but still was super good. I will make it again without the orange juice and just use the zest. Thank you so much for sharing this recipe! 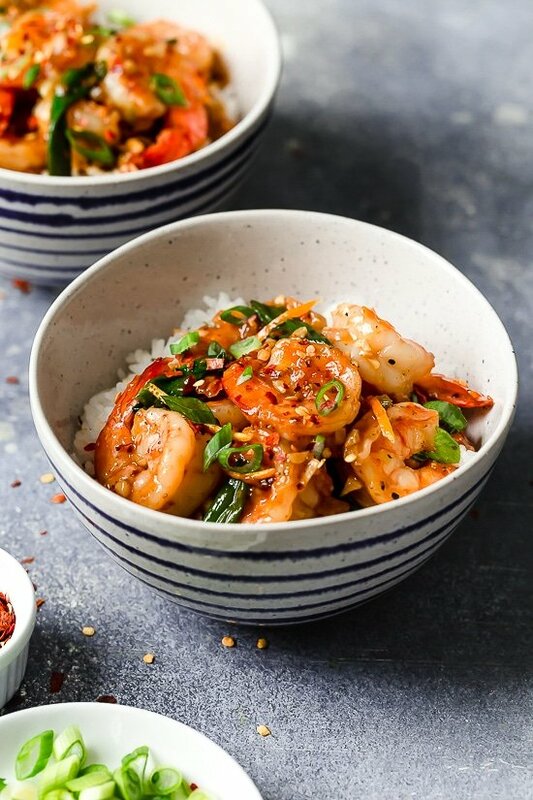 Just made this tonight- my husband (who is a very picky and generally boring eater) couldnt stop saying how good it was, and as we finished our bowls he actually said he’d race me to the stove for the rest of the shrimp!. I may do less zest next time, I was hoping for a bit more honey and soy flavor and less orange. Absolutely delicious! Made one small change, a teaspoon of sesame oil. I used a couple strips of peel and slivered it instead of using zest. This is going in our menu rotation. Thinking we might try it with chicken breast one of these times. This is the best ever! Thank you Gina! I didn’t see one piece of orange zest so I zested little pieces and it was still great and not overpoweuat all. This recipe and your pho recipe in your one and done cookbook are so far mtvtwo favorites! Thank you again! I didn’t have fresh ginger, so I used powdered. This lacked a little for me and my family. I did add Chinese 5-spice powder, which helped enhance the flavor. I don’t have scallions 😭think it is ok without them or should I substitute in onions? GINA!!! I don’t have enough words to describe how much I LOVED THIS!! Seriously, it would be IMPOSSIBLE to use enough words in the English dictionary to describe how exquisite this dish was! Thank you thank you thank you!! This is DELICIOUS!!!! I love shrimp and Asian foods so i knew this would be a recipe i would want to try. It’s now one of my favorites from skinnytaste. I menu plan on Sunday’s and i make every single dinner from your website, Gina. (So safe to say, we’ve tried almost ALL of them 😉) and this one is in the top 10!Thank you!! Not a FAN of the GINGER and I used toooo much zest !! This was so good and easy to make! We served it over cauliflower rice and had veggies on the side. Next time I’ll make extra sauce (the sauce was amazing) and will add the veggies to it. Thank you for remaking this! Can you remake more of Chrissy Teigen’s recipes or write an article offering tips on how to lighten them up? They look good, but very heavy and unhealthy! Thank you!! Hi Gina! Gonna give this one a try tonight. In your photos it looks like there are matchstick carrots in there but it’s not listed in ingredients. Are those the orange zest strips you’ve mention in the comments? 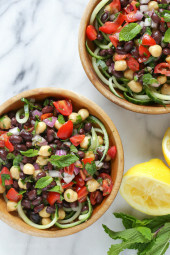 2 for 2 with SkinnyTaste recipes this week!!! Made this for dinner tonight and it was absolutely delicious! Will add broccoli next time! The sauce is so complex and has so many different notes to it. Best part is the ingredients are things I usually have on hand! Soooo good. This recipe is a must try!! Your shrimp dish is OUTSTANDING! So packed with flavor! We substituted cauliflower rice for regular rice, which kept the point value low. We quadrupled the recipe and used 4 lbs of shrimp to have leftovers for a couple of days. I ate it today for lunch and it seems that the longer this dish sits, the more flavorful it gets. I will be making this again! Thank you, Gina! 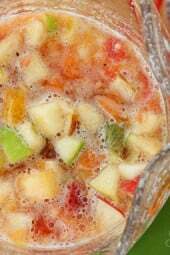 Another Phenomenal Recipe – I added water chest nuts to it. Definitely make extra sauce to pour over rice and sautéed veggies. Hi Gina! This sounds great and going to try it tomorrow. One question though – when I enter the nutritional values into WW it comes up as 6 Freestyle points but it says on in the recipe that it’s only 2 points. Should it be 6 or 2? Hi Michele, are you using the recipe builder? The only accurate way to determine any recipe’s SmartPoints® value is to plug the ingredients into the recipe builder on the Weight Watchers website (Click on “My Foods,” select “Recipe,” and click “Create a recipe.”) which does not count fruits and vegetables in recipes in the calculations as they are now 0 points. Oh Ok!!! Yay! 2 Points!! Thank you so much Gina! I made this last night – and it was outstanding! Thank you! Made this for lunch today ….I made the full amount of sauce for two servings, but then added snow peas and bell bell peppers. I also cut the garlic in half, because 6 cloves seemed like too much. I used a hot honey instead of the honey and red pepper flake, which worked out nicely. Very tasty and simple, and could be made with many different veggies. The combination of the orange/sweet/heat was great. Oh my gosh! Just made this for lunch and served it over brown rice! Gina, you’ve done it again. ⭐️⭐️⭐️⭐️⭐️ Delicious! Another delicious and easy recipe!! Made just as written-loved it! Think it would be just as fantastic with chicken, too! I made this last night using chicken breasts. It was really quick and easy to put together and the kids loved it. Gina, I have filled out the Skinny Taste on line request to receive your recipes by email and haven’t been successful . Despite many tries. A friend of mine forwards her emails to me. Would you help me out please. I just added you Devon, let me know if you start to get them! I made this last night and it was really good. Hubby loved it and didn’t need to add extra hot sauce. Made this tonight, and it was wonderful! A question, though. I scrupulously grated the orange peel, but don’t see where in the recipe it is to be added. I’ve decided it was implied to add it to the juice mixture right at the beginning, It doesn’t specifically say to, so I didn’t. Saw it sitting on the counter as I was finishing up the cooking so I threw it in at that time, It was fine, but Gina, please, where is it intended to be added? With the orange juice, thanks for pointing that out. Sounds GREAT !!! Regarding SOY… we only use Liquid Aminos instead of Soy Sauce… perfect swap! THIS recipe is without a doubt the BEST calorie conscious meal I have probably ever had. It was delicious and I can’t wait to make it again. I followed the recipe exactly as written and I do this the 1st time I make a recipe, then I change to my taste. I will NOT be changing anything and I urge everyone to try this…. you will be as excited as I am……..
Sooooo good! Can’t wait to make this again! This was amazing!!! I doubled the red pepper flakes because we like it spicy. Definitely a keeper! I do not eat Soy but this sounds SO good. Would it be just as good without the soy? I often sub Bragg Coconut Aminos for soy sauce. #9 in the directions mentions a strip of orange zest that isn’t previously mentioned. Is that a typo? Thank you, yes, I add a strip of orange zest. I live alone –can this recipe be cut in half or would it be better to freeze portions? Thanks for posting! I actually made this recently from the Cravings book but didn’t buy the book so I didn’t have a copy of it! Excited to make again with your modifications to make it a bit healthier! I’m making this tonight and was wondering the same thing. I think I will do the zest. It also looks like there sprinkled around. Completely agree on this- I would leave out the zest or use a strip in the future (wish I’d read ahead before making)- I thought the zest made it a little bitter. Agree!! This was my first “miss” with skinnytaste. Next time I will definitely leave out the zest. Oh man, me too. I found the orange flavor to be way too overpowering. In addition to leaving out the zest, I wonder if there’s any substitution for the orange juice for those of us who just don’t love the flavor of orange. Definitely!! Far too much orange zest. Unfortunately I couldn’t taste anything else but the bitter orange rind which was disappointing as this looked so good. I looked up Chrissy Teigen’s original recipe and while she does use the orange rind strip in the sauce as she’s thickening it, she only zests half an orange and then uses a few pinches of it as a garnish at the end, it’s not actually included in the sauce at all. I think that’s where this recipe went wrong. I’m going to retry and leave the orange zest out entirely and only use the strip of rind. Me too! Hubby did like although was a bit bitter. We will try it again. Remade this with only two pinches of orange zest and it was ideal, perfect balance of sweet and spicy! What would be a good veggie to add into this bowl? Sugar snap peas would be great as well. This is on the menu for tonight’s dinner. Have to use already squeezed OJ, but it’s fresh pressed at our market every morning. Also, pics look like there may be some matchstick carrots in there? Can’t wait to make this tonight! Made it tonight. It was delicious even though we substituted the orange juice with juice from Cuties. This might seem crazy, but can the orange juice / zest be replaced with anything? I want to make this but I don’t love orange!! Made this tonight! It was yummy! I did add some red pepper-the lesser amount you list in the recipe. I think I may cut it a little more next time. Of course, I used BIG garlic cloves. So it oculd’ve been that. But not cutting down the garlic, no sireee! And in answer to Rosa above, the orange was wonderful, and was a major part of the flavor, so I’m not sure I would use lemon. This is a keeper! Can you use regular orange juice? Hi! Recipe looks wonderful! I’m new to WW and looking at the points listed. I see 2 and then +5. Are the shrimp/sauce 2 pt.s and rice 5 pts.? Thank you! Please, please don’t remove the points plus!! Does the 2 points include the rice? No, 8 shrimps with sauce. When I added the calculations to my app it says the shrimp with sauce is 6 points. I’m curious how you got 2? Ps. I love all your recipes!!! What are your thoughts on using premade norange juice? I used orange juice and it was still yummy although I didn’t have anything to compare it to. I don’t have any oranges. Will Meyer lemons work? Maybe, but I would use less so it’s not too tart. Rosa — did you try with Lemons? How did it turn out? Can you make this with chicken breast? I had a funny feeling this was going to be asked!